News coverage of Southern Illinois and St. Louis area dirt track racing. Offers dirt track racing photos, discussions and newsletters. Online magazine featuring latest points standings, driver interviews, racing news, track locator and dirt track trading post. Coverage of dirt Late Model dirt track racing. Includes chats, forums, photo album and links. Dirt track auto racing in and around the state of Minnesota including Sprints, Late Models, Modifieds, Super Stocks, Street Stocks. Cornwalls 1/4 mile, oval, track features the Modified Super DIRT Series, Empire Super Sprints and the Turning Stone DIRT 358-Modified Championship Series. Schedule, point standings, race results, news, track information and photo gallery. This multi-purpose facility includes a dragstrip, road course, motocross track and 3/8 dirt track oval. Track information, links and schedules. This 5/8 mile, semi banked, dirt oval track features Street Stocks, Modifieds and Fever 4 Cylinder racing events. Schedule, photos, and track information. Talk about dirt track racing throughout the state of Mississippi with classified ads and upcoming events. Located in Talledega this dirt track offers Late Model, Stock Car, IMCA modifieds and Go-Kart racing events. Track facts, rules, schedule, race results, points, driver profiles and photo gallery. This 5/8 mile dirt oval auto racing track includes Modifieds, DIRT Sportsman, Pro Stocks and Pure Stocks. Schedule, results, points and kids club. Stock car and kart racing on a dirt track located in LaFayette. Links, pictures, results, rules and track information. Dirt track stock car racing with links to information about races, photos, rules, drivers, schedule and other related items. This 5/8 mile, semi banked, dirt oval race track features Street Stocks, Modifieds and Fever 4 Cylinder racing events. Vintage dirt track stock car racing, 1928 through 1948 stock cars, racing on dirt tracks in the midwest. Dirt track racing on a 5/16 mile, high banked, oval track featuring Sprint cars, UMP modified cars, Pro Stock cars, USAC Midgets, and Dwarfs. Schedule, news, points, racers workshop, photo gallery, track information and chat room. Dirt track racing on a 5/16 mile, high banked, oval track featuring Sprint cars, UMP modified cars, Pro Stock cars, USAC Midgets, and Dwarfs. Includes schedule, news, points, racers workshop, photo gallery, track information and chat room. CORR Sanctioned Offroad dirt race track located in Bark River. Schedule, rules, track information and driving directions. This 3/8 mile, dirt, oval track features WISSOTA sanctioned racing events. Located in Huron. Track details, schedule, driver profiles and car show information. Knoxville is the home to this 1/2 mile, dirt, oval race track. Racing events include SCRA Sprints, USAC Dirt Champ Cars and IMCA Modifieds. Also, the home of the National Sprint Car Hall of Fame and the Knoxville Nationals. Motorcycle dirt track racing series, centrally located featuring classes for modern and vintage motorcycles for both professional and amateur racers of all ages. This 3/8th mile, high banked, dirt track is located in the city of Clanton. It features Open Wheels, Super Stocks, Street Stock and Pony Cars. Site includes, driver links, forum, rules, track information, point standings and photos. If the business hours of The Dirt Forum in may vary on holidays like Valentine’s Day, Washington’s Birthday, St. Patrick’s Day, Easter, Easter eve and Mother’s day. We display standard opening hours and price ranges in our profile site. We recommend to check out thedirtforum.com/ for further information. 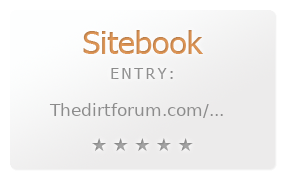 You can also search for Alternatives for thedirtforum.com/ on our Review Site Sitebook.org All trademarks are the property of their respective owners. If we should delete this entry, please send us a short E-Mail.